New Delhi: Chief Election Commissioner of India O P Rawat today announced the election schedule for the General election to the Legislative Assemblies of Chhattisgarh, Madhya Pradesh, Rajasthan, Mizoram and Telangana. By virtue of its powers, duties and functions under Article 324 read,with Article 1.72(l) of the Constitution of India and Section 15 of the Representation of the people Act, 1951, and the judgement of the Supreme Court in Special Reference No. 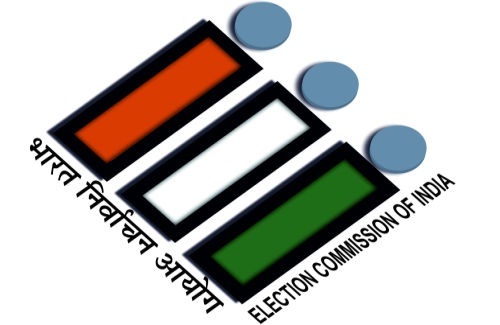 1 of 2002, the Commission was required to hold general elections to constitute the new Legislative Assemblies in the States is Chhattisgarh, Madhya Pradesh, Raiasthan & Mizoram before expiry of their present terms and in the State of Telangana, where the State Legislative Assembly has been prematurely dissolved, within a period of six months from the date of premature dissolution of the Assembly i,e. by 5 March 2019. 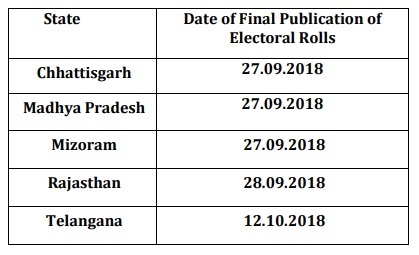 The Commission, after visiting the poll bound States, had directed the State election machinery to ensure a smooth, effective, inclusive and time-bound completion of 2nd Special Summary Revision of Electoral Rolls with reference to 01.01.2018 as the qualifying date, so as to ensure that all eligible but un-enrolled citizens in the States are duly registered in the Electoral Rolls. Special efforts were made to identify the critical gaps in the electoral rolls and targeted SVEEP activities were carried out to address them.